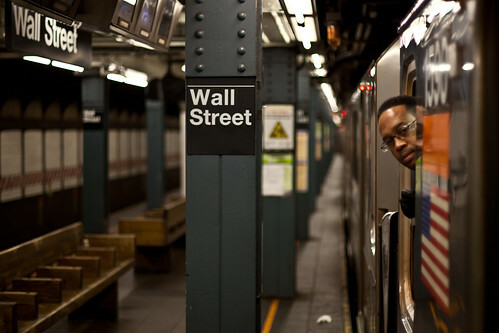 The Doors are Closing on Wall Street, originally uploaded by pamhule. Here's another conductor portrait. The lens is Canon's 50mm 1.4. Focusing with the lens is not a speedy process and the result often strikes me as a bit soft or slightly inaccurate--including this shot (in the end I liked the look of the conductor too much to discard it). I would be curious to hear what experience others have had with this lens in terms of focusing speed and accuracy. For more conductor portraits, see this set on flickr. I love the environmental portrait! Judt love it. I haven't played with Canon's 50mm 1.4, but I just bought a Carl Zeiss 50mm for Canon and I just love it, it is manual focus so focusing would be even slower, but the crispness is without par. When I was buying my prime 50, I testes the 1.4 for about a week and had similar feelings. I didn't see much online with people complaining about it though. Ultimately, the mechanics of the lens pushed me to go with the 1.2 which is unreasonably more expensive, but I can't say enough good things about the lens. Kind of hurt at the time, but you average the extra cost of years (hopefully many) and it becomes easier to stomach. Regardless, love the portrait ... the lens still does a great job representing color and the DOF is very nice. Also, Martin - the Zeiss lens is absolutely awesome. Very impressed with the sharpness. I know the feeling. I really am frustrated when a very good shot isn't in focus. Focus is the prerequisite to a good photograph. I don't have that lens. I have a more all-purpose Canon 17-55mm, which has very good focus speed, though of course, not like one's eyeball.